VICSYSTEM is based on the knowledge and experience of Irina Mikitenko. The training plans are continually adapted together with Irina and adjusted to the needs of the runners on one side, as well as to the newest perceptions and knowledge of the world class runners on the other side. 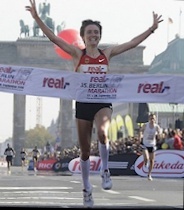 Irina Mikitenko broke the 2:20-barrier in only the third marathon of her career, with a time of 2:19:19 (Berlin 2008), to become the fourth fastest female runner of all time for this distance. Irina is a German citizen, lives with her family near Frankfurt, studied sports, is a certified sports teacher and holds a trainers license. She designs her own training with her husband Alexander, who himself ran the 5’000m with a time of 13:39,95. VICSYSTEM works for you too! VICSYSTEM offers an accurately calculated training program for all runners, whether you are a beginner with only a few training days a week or a top athlete with two training opportunties and one cross-training a day. Good Luck, your VICSYSTEM-Team (→ Join).